Our house is made up of books. Pages and bindings fill as many cracks as we can stuff them into. Stories line our walls, cocooning us in a world of words. And now they do that for Griffin. Of all the children’s stories we knew, the one’s we loved most seemed to be classic British children’s literature. From Winnie the Pooh and Peter Pan, to Narnia and Harry Potter, Griffin’s room is a creative mix of different worlds and lands that were founded by their authors in the UK. The style is very classic, almost Victorian in certain elements, evoking a feeling of the nursery Peter would have flown into when looking for children to take to Neverland. When entering the room, a signpost guides the way, telling what wonderful worlds await. A ship lights the way, always pointing towards the second star to the right. The Hundred Acre Wood and Neverland make prominent appearances, but slight nods to the world of Harry Potter can be found, as in the snowy owl perched atop the crib. My favorite aspect of the room is probably the compass and ship chandelier, but I really love the sign post, as well. We were lucky to find a local painter in Nashville who could take anything I envisioned and make it a reality! Start a Pinterest board! I posted any idea or item that inspired me for months before making the first purchase. I honestly just chose things that made me happy, because I knew that would rub off on my baby, as well. I love this “fairy tale”, love of reading inspired nursery! Beautiful job. Timeless!! 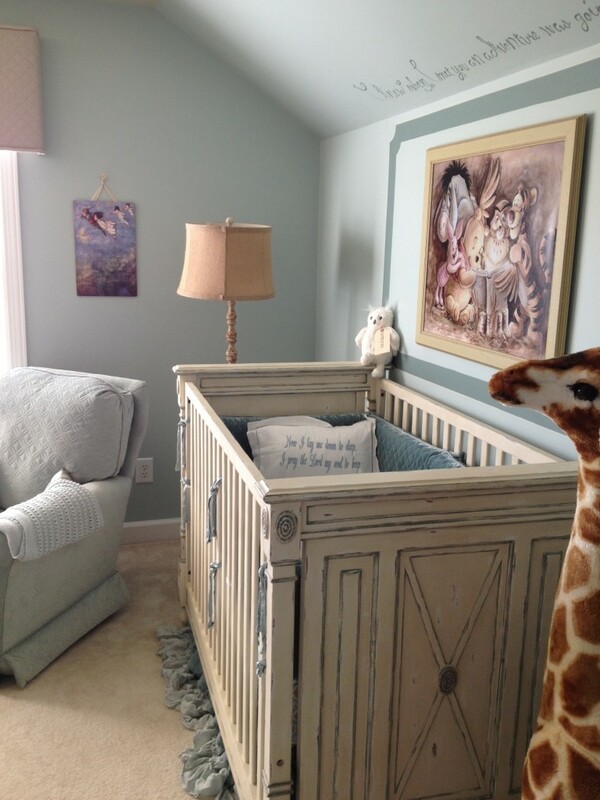 Such a sweet and classic nursery! I am sure this little one is off to Neverland as soon as he drifts off to sleep! Love it!!! May I ask what the wall color is? A room based on books and stories? Magical! And that ship chandelier is just gorgeous! Where did you get the ship and compass chandelier? Writer of Fact and Fairy Tale, Meandering Traveler, Gluten-Free Foodie.